Anyone even vaguely familiar with the Christian Bible knows that there has never been a translation yet that surpassed the King James. What nobody ever mentions – and something I had never before considered – is that the KJV Bible was created and produced at the very pinnacle of Shakespeare’s career. Not by him, of course. Though there are legends about his alleged involvement. But how many people, when they praise the unmatched linguistic beauty of that bible, know it sprang from the very same time and place as Shakespeare? 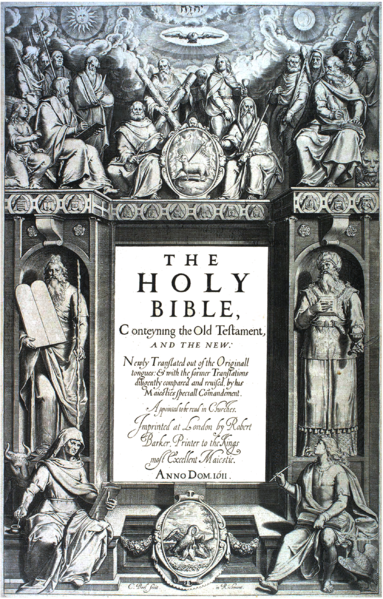 The King James Version (KJV), commonly known as the Authorized Version (AV) or King James Bible (KJB), is an English translation of the Christian Bible for the Church of England begun in 1604 and completed in 1611. Now that I know this, it makes me wonder how much of Shakespeare’s eloquence was “in the air” during that momentous decade of literary achievement… not to take anything away from him, but rather to better understand the context of early 17th century England. The documentary in its entirety may be viewed HERE. Who knows how destiny ultimately works, or why certain people happen to be born at just the right moment in time. Such questions are not mere idle speculation. Famous authors and philosophers such as Hegel and Leo Tolstoy famously pondered whether great individuals make history or whether history makes great individuals. It’s fun (and unnerving) to consider such possibilities as: had William Shakespeare never been born, would history have invented somebody else just like him? Or: if William Shakespeare had written in any other age, how would his work have sounded? With the coincidence of Shakespeare’s career high point occurring exactly during production of the King James Bible, it’s tempting to imagine that Shakespeare had a hand in the KJV. And it turns out that such legends exist. For several decades a popular rumor has persisted that William Shakespeare placed his mark on the translated text of Psalm 46 that appears in the King James Bible, although scholars view this as unlikely. By coincidence, the 46th word from the beginning of Psalm 46 is “shake” and the 46th word from the end (omitting the liturgical mark “Selah”) is “spear”. Shakespeare was in King James’ service during the preparation of the King James Bible, and he was 46 years old in 1611 when the translation was completed. I need to investigate further. But now and forevermore, Shakespeare and the King James Bible will be linked together in my head and heart, if only by a bizarre coincidence of time and space. In a related note, I do not believe in coincidence! This entry was posted on 2014/01/19 at 8:14 am and is filed under Context, Language, Shakespeareana with tags Hegel, King James, Tolstoy. You can follow any responses to this entry through the RSS 2.0 feed. You can leave a response, or trackback from your own site. I used to be addicted to Shakespeare and the King James Bible is my favorite translation. I am sure that John Milton was greatly influenced by Shakespeare and the King James Bible. What astounds me is that both the King James and Shakespeare achieve perfection in the same historical decade. Why is this never mentioned? Something had to be in the air. The English language reached a pinnacle. But does that make Shakespeare a product of the age or the creator of it? Chicken and egg, I guess. Thanks for your comment! Feel free to stop by any time.